The signing ceremony of MoU between UNIST and Ulsan Metropolitan Office of Education took place at UNIST on April 8, 2019. 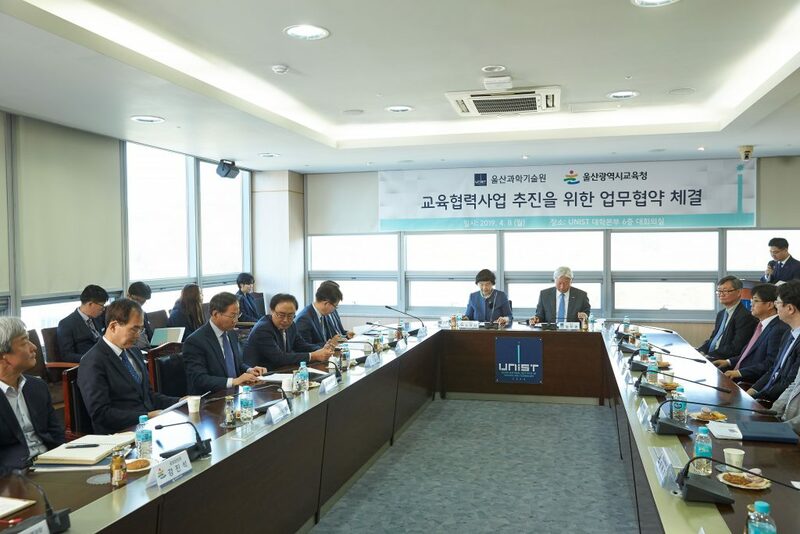 On April 8, UNIST signed a Memorandum of Understanding (MoU) with Ulsan Metropolitan Office of Education to forge ahead toward achieving educational excellence. Took place in the 6F main conference room, located in the Main Administration Building at UNIST, the ceremony has been attended by President Mooyoung Jung of UNIST, Superintendent Ok-Hee Noh of Ulsan Metropolitan Office of Education, and 30 other officials from both organizations. This agreement can be viewed as an expansion of previous agreement signed in 2010. During the ceremony, the two organizations promised to promote a deeper cooperation in the field of youth education in order to fit into the new era where science and technology become increasingly important. 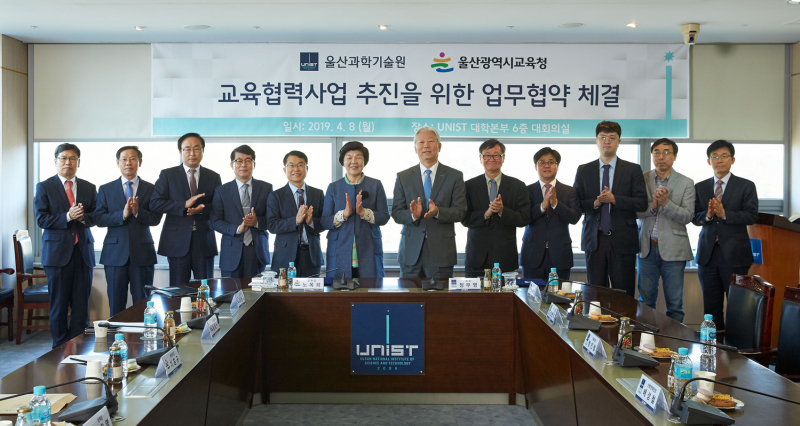 UNIST and Ulsan Metropolitan Office of Education will join forces to run student career experience & mentoring programs to cope with the fourth industrial revolution. Under this partnership, both organizations have agreed to collaborate on the following areas: ▲ Career experience program & mentoring support for 4IR ▲ Support for reinforcing faculty capability in software-related education ▲ Research and education programs for science-gifted students ▲ Support for science-related R&E projects and consultation ▲ Support of laboratory work on a unique experimental equipment & special lectures ▲ Other cooperation in education. After the ceremony, the officials of Ulsan Metropolitan Office of Education took a guided tour of the UNIST Central Research Facilities (UCRF) and the Seawater Resources Technology Research Center. This was followed by a tour of Learning Commons to learn more about UNIST’s unique curriculum.